Imagine an -dimensional space describing every conceivable humanoid face, where each dimension represents a different facial characteristic. Within this continuous space, it would be possible to traverse a path from any face to any other face, morphing through locally similar faces along that path. We will describe and demonstrate a development system we have created to explore what it means to ‘surf’through face space. We will present our investigation of the relationships between facial types and how this understanding can be used to create new communication and expression systems. While a multi-dimensional space is a convenient way to generate a universe of faces, it has a slippery relationship to the ways we perceive facial similarity and sort faces into different categories. We currently measure facial similarity by values of low level facial parameters, such as chin width, eye radius, etc., based on our knowledge of creating facial animation systems for the graphics and avatar industries however perceived similarity operates on a different metric. The correlation between facial parameter values and perceived race, age, gender, or cultural stereotype is even less straightforward. It is this experimentation with classifications and their facial relationships, as well as how a viewer reacts to them, which have provided the motivation to create this development environment. The system uses a genetic algorithm technique known as aesthetic selection to search through face space, using approximately 25 parameters to specify the genotype. 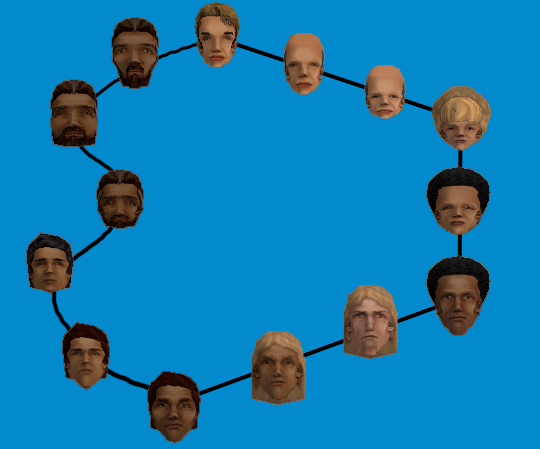 An earlier version of this system was developed as a freely downloadable web tool, which allows users to create families of 3d heads for use in the popular simulation game “The Sims” by Maxis. In this version a menu of random faces is generated from random points in face space. By selecting one of the faces, the user is able to surf through the local region centered around the selected face and can increase or decrease the local region of similarly looking faces by the use of a mutation rate slider and other controls. In this way, novice users can “find” or breed a face or family of related faces that appeal to them for use in the game. A large web based community is currently using this system to make thousands of faces. In addition, these users have the ability to publish and trade faces on the web and even breed their creations with those of other users. Every head or family of heads becomes a local starting point or region in face space. What we have found is that a user will have a strong emotional response to certain faces they encounter (which appears to have cultural underpinnings) and that this emotional attachment continues as they surf that locally related face space. By expanding this system into a full development tool, we hope to better understand these cultural relationships for both specific faces as well as their relationship to other faces in face space. It is well known that we humans have specific neuroprogramming for recognizing and interpreting faces. It is hoped that we can use the face space development system to better understand the conscious and intuitive meaning of faces and the universal language they appear to represent (facial meaning and inter-relationships) for use in the arts, cultural theory and communication. Acknowledgements: Roger Critchlow for co-authoring the FaceLift system. John Wentworth and Will Wright for their ideas and support. This work was started, when Steve DiPaola was a researcher at NYIT Computer Graphics Lab under the pioneer of face animation research – Fred Parke (now at Texas A&M). Much of this current work came from NYIT and was also created in this form as a web based free tool for Electronic Art’s in cooperation with Luc Barthelet and Will Wright at Maxis for the game “The Sims” under a non-exclusive license. That software was written in Tcl and Open GL. The work has evolved here at the iVizLab. FaceLift Page More info on “The Sims” version of faceSapce called FaceLift from DiPaola’s site. FaceLift Download Site EA Maxis’s “The Sims” site where you can download the FaceLift version of FaceSpace.